I've made the move with my blog! Please go over and have a look at the new Hayley from Home. It has a new shiny design and I've gone self-hosted. It's still a work in progress but I'll be writing all my posts on there from now on so please update in your readers. Over a month ago now we decided that we had to take the plunge and move Lucas into his big boy bed and new room. I was already feeling guilty that he was being moved into the smaller room as with twins on the way we will need his original room for them. Fortunately, we hadn't decorated his old room so we were able to make his new bedroom like a proper child's bedroom; all colourful and exciting. I promise I will get a post up about this while it still looks like a newly decorated room! We thought we might as well make the change to a big bed well before the babies arrived so he would be settled and happy with a new bedtime routine. He seemed quite interested to see his new bed being put together and we chose a date when we would move him in. I was so convinced that he would be up as soon as we put him down, that he would be running up and down the landing or awake playing. We relocated his favourite books and teddies and did the whole bedtime routine in his new room. Come that night I felt terrible and I can't even explain why! I didn't want to leave him in the bed; he looked so little. He was actually really happy going into his bed but it took him a while to figure out where to lie and what to do with the duvet. It was his confused expression as we said night night and shut the door that got to me; I wanted to go back in and sit with him but I knew there is no way he'd sleep while I was in the room. We both stood outside his room looking at each other in silence but eventually decided to sit downstairs. We sat, not speaking, no television on, just waiting for any sign that he was up or had fallen out of bed but there nothing, not a peep. We couldn't believe it, I was itching to go up and check on him but I didn't want to disturb him. 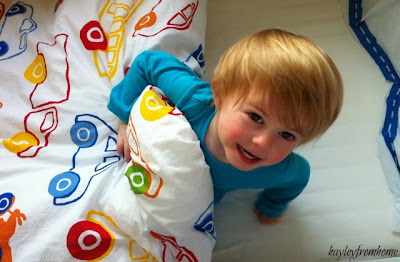 I checked before we went to bed and eagerly dashed into his room in the morning to get him up. He was quite happy and I felt so relieved. That week we had a few disturbances early on in the evening. I went in one night and thought I'd just sit with him until he drifted off but instead he started chatting to me about the car stickers and bouncing on the bed. I realised that tactic wasn't going to work with Lucas so I told him it was time to sleep, kissed him goodnight again and left. To my utter surprise he stayed in bed and went to sleep. Some evenings we could hear him chattering but he always managed to get himself off to sleep. 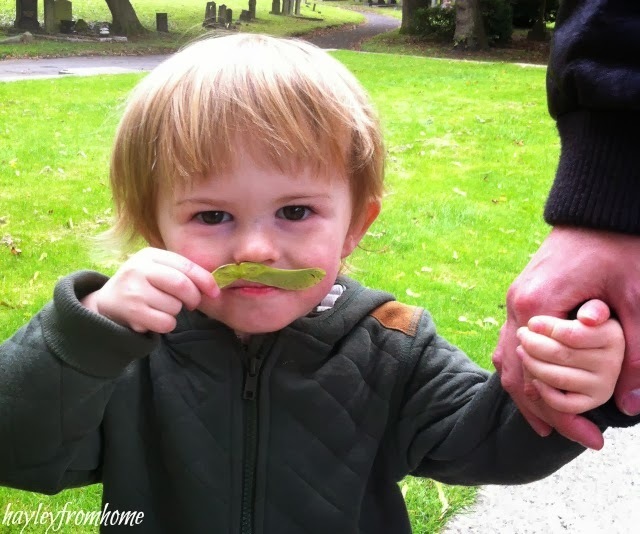 I still felt anxious at bedtime for at least two weeks and I would have loved for everything to stay the same but it can't, he is growing up and soon he will be a big brother. I am so proud of how well he has coped with the transition and now he has a lovely little space to call his own. 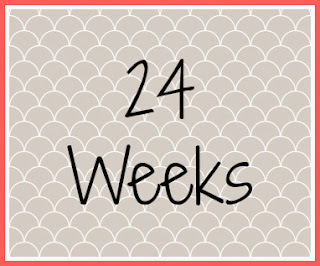 Breathing a little easier now our two boys have reached 24 weeks and it all is still going smoothly. Since we found out they are actually MC/DA it's like a great weight has been lifted of our shoulders and I feel so much more relaxed. I had another scan last week and a check up with my original consultant I feel much better after seeing her and being able to discuss things with a positive attitude. We are back to expecting them at 36/37 weeks and depending on their position or my preference, I can go for a natural birth or a caesarean That is something I'm still not quite ready to make a decision about but hopefully we'll have a few months yet. The babies are now proportioned like newborns while all their organs continue to develop and they put weight on. The growth of both of them is still on track and they are very active. At my last scan they were both breech but I can feel them moving so I'm sure they will continue to switch position for a few weeks yet. Apparently they will stop in one position soon as their won't be much room for them to turn. I can feel them much more than I ever did with Lucas, he never kept me awake at night but these two are starting too. I'm feeling a lot bigger all of a sudden; I can't even imagine what the last few weeks will be like this time round. I'm also absolutely ravenous! I've gone from having to practically force myself to keep eating to just hovering around the kitchen while I eat anything that comes to hand. I'm taking this as a good sign that my body is preparing for the growing twins. I'm definitely feeling the aches and pains as I get bigger but they aren't bad enough to stop me getting out. Overall physically I still feel good, if it hadn't been for the emotions of the last few weeks this pregnancy would have been trouble free. I've started putting some things together for my hospital bag; as there is a higher chance of twins arriving early I need to be prepared. Of course this is a great excuse to pick up little mini goodies to stock up my wash bag (alongside the obligatory massive pants!) I have another scan and consultant appointment booked for two weeks then all being well they'll go down to every four weeks and before we know it we'll be preparing for our extra additions. I'm so pleased that we have managed to get some outdoor time into our weekend. We've been so busy with appointments and the weather hasn't been great that we hadn't managed to get out as much as I would have liked. Doesn't a bit of fresh air always make you feel better though? We love to get out and walk; take an hour or so away from everything else and just enjoy each others company. 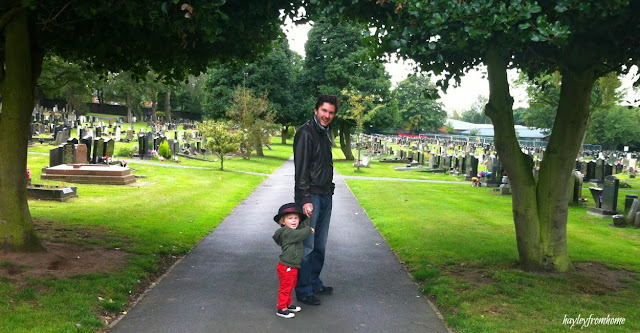 This weekend we went for our walk around our town's cemetery; you might think that's a bit strange but it's such a nice walk full of really old trees and very peaceful up there. So many local people go for walks round there and it is lovely in Autumn. They also have so many chestnut trees, perfect at this time of year. 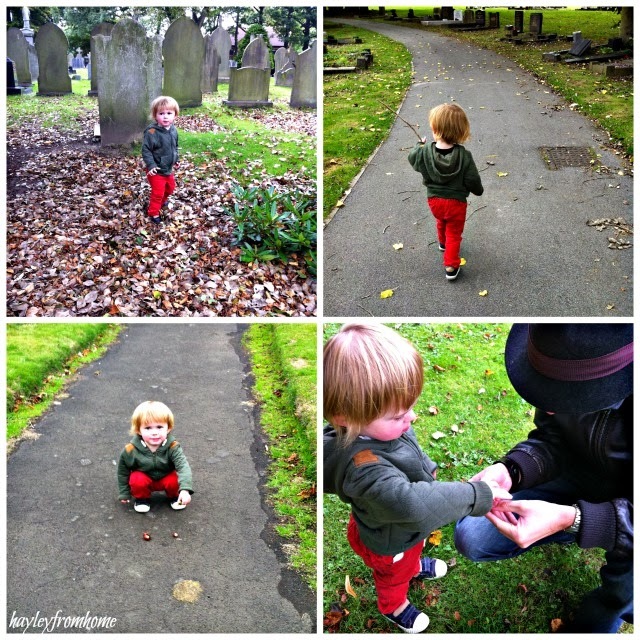 I wanted to collect some treasure for us to start an autumn nature box and we were lucky enough to come across some early conkers and beautifully coloured leaves. There were a few people out hunting around the chestnut trees, it's a serious business! We also found a particularly good game to play with the 'helicopters' from a massive Sycamore tree; they weren't quite ready for spinning but made a rather amusing moustache. As Lucas gets older it's great to see him learning new things and he was quite particular that he carried his conkers rather than put them in the bag. Of course we also had to collect a few sticks and some very green acorns. Lucas loved it when we found a conker still in it's shell and we could open it for him to get out. They are now dotted around the house while I look for a suitable container to keep them in and I'll cover the leaves in sticky back plastic so they can be played with. I'm hoping we'll be able to add some pine cones and more acorns when they turn brown, what else would you be on the hunt for? Everything has been very pregnancy heavy this week so I fancied distracting myself with a little wishlist. I am so in love with Autumn and I always feel more inclined to organise, buy treats and make changes at this time of year. I'm sure it must be the back to school mentality from my childhood! Here are a few bits and bobs I would love to have over Autumn/Winter. 1. I'm sure a buy a new pair of gloves every year but I still love them. I'm much more of a knitted kind of girl and fingerless gloves are my favourite so I can access my phone when out and about. These Long Fair Isle Trapper Gloves from John Lewis (£15.00) are just my style. 2. Another essential buy every Autumn, this year I am in desperate need of some Maternity Tights, I love the colour of these from Tesco (£10.00). 3. I cannot say enough good things about Moroccan Oil! I was lucky enough to get a little bottle in a goody bag for an event I attended hosted by My Bag, Look Fantastic and All Sole. I have been using it religiously since and my hair feel super smooth and I find I can leave it longer between washes. I had a mini consultation at the event and they recommended the Light Treatment (£31.85) for my fine hair; it is perfect for taming my dry winter hair. 4. I get especially excited about Lush products in Autumn, particularity their Christmas bits. I don't get to buy them as often as I did so they are a real treat and Dreamtime Bath Melt (£3.25) is an all time favourite. 5. I had to include some new stationery and I'm a sucker for cute notebooks; this one is an Eco Bamboo Notebook (£4.50) from Paperchase. 6. In my Autumn Tag I mentioned I was on the hunt for some canned pumpkin (£2.00) as I love to make pumpkin pie but it really is a pain to make puree from a fresh pumpkin. Luckily Leeks and Limoni told me she had spotted some in the World Foods section of her local Tesco and I have found it too in mine, yey! Pumpkin Pie for everyone! 7. These are really cool little sewing kits from Paper & String that I discovered a few years ago. I bought a couple last year when I had my gall bladder removed and I was confined to the sofa. I'm usually terrible and things like this but these are so easy and great fun. I'm espeically liking the look of this Robin Mini Kit (£5.00). Is there anything that you love to buy in Autumn, what would be on your wishlist? Another emotionally exhausting week has passed and I'm updating a little earlier than usual because so much has changed. We've had some amazing news about our twins that has been a total weight of my shoulders but at the same time feeling very let down by our original hospital. If you've been following my pregnancy diary you'll know that early on I was told the twins appeared to be MC/MA sharing a placenta and sac. When I looked into to it myself it seemed that they sometimes spotted the membrane later on but 5 scans later my notes hadn't changed and no one had told me any different. I had a very scary conversation with the consultant and had to face up to the fact that these babies might not survive We were referred to a specialist at a different hospital, went in for our scan which was with a lovely Doctor and one of the first things she spotted...a membrane! I held my breath while she checked the babies out and had a double check but even we could see it. All I felt was absolute relieve and struggled to keep my emotions in check while she finished the scan. I could not be happier that our twins have been confirmed to now be MC/DA meaning they are still identical, sharing a placenta but in separate sacs. One of the first things she explained was that there is no risk of cord entanglement now - the thing that was keeping me awake at night as my original consultant hadn't given me much hope. She also said I could now be referred back to my original hospital for the rest of my care. The thought does not fill me with much joy; the ante-natal department only spotted the MC/MA on my notes at 20 weeks and I've had it confirmed that I should have seen the doctors at the specialist hospital straight after it was first suspected. Fair enough they still may not have picked it up until later on but I had more information and reassurance from that doctor in that one appointment than I have the whole way through my care. I am never quick to complain and it isn't in my nature to kick up a fuss but I can't help but feel like the time wasn't taken to explain things to me. While it all looks good for now and I should be able to carry the babies until 36/37 weeks there is still a chance of early labour as there is with all twins and I'm afraid this experience hasn't left me with much confidence. I have to say that on the whole I am a massive supporter of the NHS, I think so many staff do an amazing job and I have nothing but good things to say about the staff at my first delivery (at a different hospital). I could rest easy with this one and I can't help feeling that maybe some of this stress and upset could have been avoided. It has only been a week since they told me and I feel like it has been months of worry. Thank you all for your kind wishes, I am honestly overjoyed that these little boys will have a safer future. I can't wait for them to be here safe in our arms! When I first found out I was pregnant I never imagined it being like this and I think this time I will be glad when it's all over and we have two healthy little boys to bring home and add to our family. The lovely Shona and Cecile from Wriggly Rascals asked me to do a guest blog on the topic of conceiving twins naturally; as I am expecting identical twins I decided to share my experience and hopefully it will help some other parents. You can read the full article here. Have you conceived twins naturally? If so, did you have a family history of twins or any of the other predisposing factors? If you have conceived twins naturally please share your experience here and help another mum work out her chances of conceiving twins. Wriggly Rascals are also on Twitter and Facebook so pop over and say hello to them!